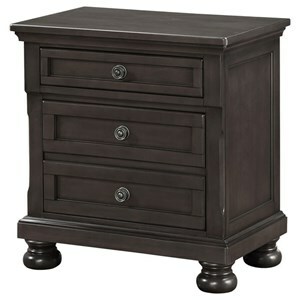 Offering classic, timeless style, this traditional night stand will make a great addition to your home. Sabre legs and the double serpentine form creates a level of interest will only enhance your bedroom. No details were overlooked on this piece featuring fully finished drawers, English dovetail construction, and wood on wood drawer guides that will support a greater weight than metal. For versatility, this piece is sold with both matching and contrasting hardware options. The Classics Traditional Night Stand with Changeable Hardware by Bassett at VanDrie Home Furnishings in the Cadillac, Traverse City, Big Rapids, Houghton Lake and Northern Michigan area. Product availability may vary. Contact us for the most current availability on this product. Finish & Paint Options Available finishes include slate, dusk, oyster, shimmery bronze, and onyx. See store for availability. Drawer / Shelf Construction English dovetail construction. Dust divider between drawers.